Synopsis: Sixteen-year-old Evening Spiker lives an affluent life in San Francisco with her mother, EmmaRose, a successful geneticist and owner of Spiker Biotech. Sure, Evening misses her father who died mysteriously, but she’s never really questioned it. Much like how she’s never stopped to think how off it is that she’s never been sick. That is, until she’s struck by a car and is exposed to extensive injuries. Injuries that seem to be healing faster than physically possible. Review: I was quite surprised by this novel as I did not expect that at all. This is a rather original way to reclaim the myth of Adam and Eve. Evening is a girl like any other until the accident that completely changed everything in her life. Indeed her leg was completely damaged and destroyed during this event and the doctors do not know what they can do to really help her. Therefore, her mother decides to take Evening in the genetic center she runs with an iron hand. Our young heroine never really asked any questions in relation to the work of her mother, or even about what people thought of her. But this intrusion into her professional life will change her way of thinking. Indeed, she meets Solo, a young boy about her age who works here and who seems to be under the tutelage of her mother … This young man has only one goal, to make EmmaRose fall, and to destroy her life as she destroyed his parents’. But when he begins to fall slowly in love with Evening, everything gets complicated and his mission is questioned. Meanwhile, our young heroine occupies herself as best as she can and her mother leaves her in charge of a project. To Create the perfect man on computer, create Adam, as she imagines him. It was a quite intriguing book, even if it’s not very extraordinary. The story is fairly common and predictable, but it’s also nice to read it. It must be said that the book is not very long in reality. However, I was very curious to find out more about Adam, to see about his creation and the character he would be. Solo and Evening are two characters fun to discover and I wondered what would become of them in the end. However, I was a little surprised by the revelations about Evening and Solo’s parents at the end of the book, and I found that the turnaround had been well chosen. So it’s a nice book without unpretentious. Not something that will really mark me but it was interesting to see a retelling about Adam and Eve. yeah, it was ok. thanks, to you too! it was fun to have a retelling like that. I like Michael Grant, but I must admit that I’ve never really been curious about this one. I’m glad you reviewed it. It doesn’t sound all that remarkable, to be honest. no it’s just ok for me. I won’t try more. I remember seeing this when it first came out but then never seeing much about it review wise. Glad it was an interesting read. Well, you can’t beat the concept. Not something I have read before. 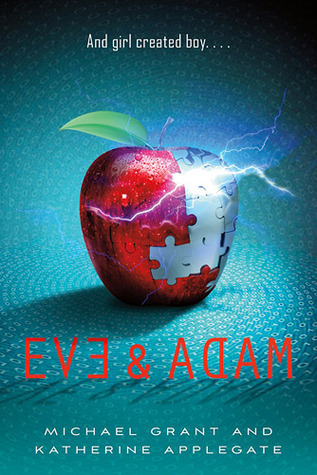 An Adam and Eve retelling – I love this idea! Sorry it wasn’t extraordinary, though.